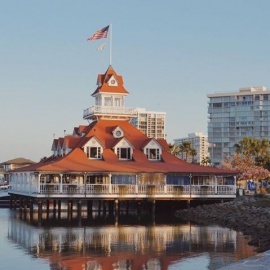 A flagship for the Bluewater family of restaurants and the first Bluewater in San Diego, Bluewater Boathouse Seafood Grill occupies the historic former Hotel Del Coronado boathouse on Coronado Island. The iconic cupola-adorned landmark was built in 1887 as a design prototype for the hotel itself and enjoys a colorful history; most recently it was the site of 1887 on the Bay Restaurant, and before that housed The Chart House, Scripps Institute of Oceanography, Coronado Yacht Club and San Diego Yacht Club. Like the original in Newport Beach, the Coronado Bluewater enjoys a decades-old reputation as a destination for great food and hospitality. Lunch, brunch and dinner menus printed regularly feature more than 40 varieties of fresh seafood and shellfish annually. Other highlights include private event facilities, an oyster bar, kid's menu, full bar with wine list and weekday happy hours. 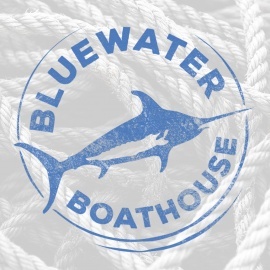 Bluewater Boathouse Seafood Grill also hosts a series of monthly seafood tasting and wine-pairing events on the second Tuesday of every month. These popular celebrations give local seafood fans the chance to learn about the latest fish varieties, and meal-planning, preparation and serving techniques right from the experts. Bluewater Grill is also known for working directly with fisherman to serve the absolute-freshest seafood and shellfish certified for sustainability by the Aquarium of the Pacific, Monterey Bay Aquarium and Marine Stewardship Council. Bluewater Boathouse Seafood Grill serves the freshest sustainable seafood and shellfish in the former Hotel del Coronado Boathouse, on Coronado Island.